Electric bicycles are the entry-level electric vehicle! It's a great way to get started with electric drive because you can typically get a great electric bike for a thousand dollars or less. One, if you run out of charge, you can pedal. Of course, by the time you've run out of charge, you're probably tired of riding anyway. You can easily get 10 miles at 15 mph. I'm not going any faster than that on a bike. I'm definitely not going any farther than that on a bike. And two, you can exercise if you want to. You can get as much or as little exercise as you like - an option you definitely don't have with an electric car. Sure, a new electric car would be nice. There's a lot of talk in the news right now about new electric cars like the Nissan Leaf, or plug-in hybrids like the Chevy Volt, and it seems like everyone's talking about the Tesla. But cars have all got something in common: they cost a lot of money. Or you can convert, but a lot of us only have one car. It takes a certain level of commitment to electric drive to convert your only car to electric. So this is where electric bikes come in: all the fun, all the benefits of an EV...without all the commitment. I'm talking today with Tim Ritchey at Emerald Velocity, an electric bicycle conversion company in the Pacific Northwest. In his public outreach for the electric vehicle community, Tim is known as the "EV Expert", teaching the basics of electric transportation to interested newcomers. Tim and I discussed the cost of electric bicycles, different types of electric bikes, and commuting by electric bicycle. Lynne: Let's talk about the cost of electric bicycles for a minute. I think a lot of people see electric cars and think "I'd like to do that, but I can't afford it". So can you get a decent electric bicycle for under a thousand dollars? Tim: The short answer is YES, you can buy an electric bicycle for less than a grand. Currie Technologies, for example sells the "ezip" and "izip" starting at $599 and $899 respectively. We actually have an IZIP Via Rapido demo in stock now that list for $1,399. We are selling that bike for around a thousand dollars. The range is between 15 to 22 miles with a top speed of 20mph. I struggle with where to put the eBike when it comes to transportation. It depends on who I'm talking to at shows, events, or at our shop. If a customer comes to me and says that they are looking for a decent electric bike for under a thousand dollars, I see them as a serious prospect who understands the cost of operating a motor vehicle. They are typically looking for an option to save money along with all of the health benefits that are naturally attached to this type of decision and thought process. On the other side of the coin, when we do EV shows or EVents, people ask me how much a typically eBike cost and I tell them between $800 and $1,500 depending on their requirements. They look at me like I just came in from Mars and reply, "I can buy a bike down at Wal-Mart for $99.00. Why would I pay as much for a bike as I did for my first car?" The answer to that question, for that particular person is, they wouldn't. The person who responds in this manner is not seeing an eBike as a form of transportation. To them, it is just a "bicycle or a weekend exercise device". It is my job to teach EV101, not convert people to electric. I've found that people are generally resistant to change so I try not to fight that battle. There are two basic flavors of electric bike, as I understand it - the type that you have to pedal but the electric motor assists you, and the type where pedaling is optional. Did I get that right? Throttle-Assist: Bikes that have a motor built into a wheel hub and are often controlled with a thumb or twist type throttle on the handlebar. Pedal-Assist: Bikes that sense how much pressure you are applying to the pedals and assist accordingly. If you apply light pressure, you will accelerate slowly. If you really get on it and apply heavy pressure, the bike will take off like a rocket. On some bikes, with both systems you can apply pressure and pull the throttle at that same time to show off with a jack-rabbit start. This will affect your range however. The more you demand from quick starts, the more power is drawn from the battery, therefore lowering your range. Do conversions also come in these two flavors? Most of the eBikes that I sell have one or the other and some offer both modes. All of the electric bicycle kits that we have in inventory at this time are throttle-assist. Can you turn off the electric motor and ride entirely on you-power to save the battery? The best part about any eBike is that it is still a bike. Turn off the power and you keep on riding! With an eBike there is no such thing as "range anxiety" or "stranded" with a dead battery. Can you pedal to recharge your batteries? As far as recharging the batteries while you pedal, that is generally called "Regen" or "regenerative braking". Some OEM eBike companies do offer models with regen and we can order them for our customers. 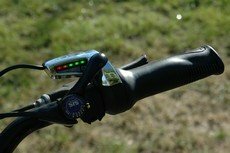 Emerald Velocity eBike kits are not set up for regenerative braking. It is our opinion that if you're riding down a hill, you are going to want all the speed and momentum you can get to get up the next hill. Regen down one hill doesn't necessarily equate to power used for the next hill. In cars it's estimated that regenerative braking will only produce up to 10-15% of the energy back to your battery pack. On a bike it doesn't even come close to those kind of numbers. No thanks, I'll just coast as fast as I can. I saw this video about electric bicycle commuting the other day, and posted it here so our readers could see it, too. She's riding a Giant Suede-E electric bicycle to work every day; she lives in Port Townsend, Washington. In the video, she said it had a kevlar-lined rear tire to avoid the possibility of a blowout. Can you get these for conversions, too? I'm glad you brought up the tire issue because it's never fun to have a flat tire and on an electric bicycle it's REALLY not fun. We do offer Kevlar-lined tires (that's same Kevlar used in police vests) and offer other types of "flat avoidance" options such as puncture resistant tubes and the like. 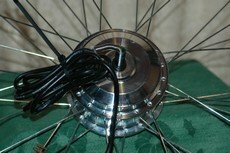 I have repaired a couple of flats on some local builds and that's when I realized I needed to offer alternatives to the standard bicycle tire and tube, especially for commuters. The Giant Suede-E is a great bike and they do make a "slope" diamond frame as well as a "step-thru". She mentioned some safety stuff on the video that I thought was pretty cool, too, like how to make sure people can see you by wearing lots of lights. We'll talk more about electric bike laws on the next page, as well as electric bike conversion. Part 2 of our electric bicycles interview here.